On October 5, RSGC took part in Orange Shirt Day. 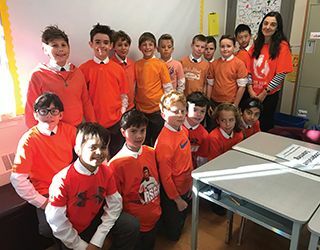 The boys wore an orange shirt over their uniforms as part of the National day, which is typically held on September 30 as a way to educate people and promote awareness about the residential school system. The boys in Grade 5 spoke extensively about Phyllis Webstad’s story of resiliency and how every child matters. As a school, we encouraged empathy-building for the experiences of children the same age as our students and touched on the notion that all Canadians have a role to play in reconciliation. The Junior School also held a smudge ceremony during assembly, coming together in the spirt of hope and reconciliation.